First, turn off any devices attached to your computer, such as the monitor, printers, etc. Consult your computer manual to learn where your case opens. You will probably need to unscrew some screws on the back of your case and slide one side of the case off. Be sure to keep track of any screws you remove so you can easily put them back into place! Once your computer case is open, lay it on its side so the opening and motherboard are facing upwards. The memory sockets in your computer should all be grouped close together, and in most cases will be black with white clips on the ends for holding the memory sticks in place. 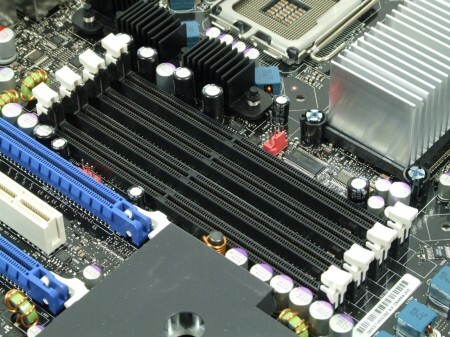 Some newer motherboards have sockets that are colors other than black, but they will all have clips on the ends for holding memory in place. Depending on your motherboard, you may have anywhere from 2 to 6 sockets (or even possibly more, if it is a server). Your computer will probably already have a memory module installed in at least one socket. If you need to remove existing memory for any reason, such as if all of your sockets are filled, then move on to step 4. Otherwise, skip ahead to step 5. Removing existing memory is a simple process. Locate the memory stick you want to remove and press down on the white clips holding the memory in place. Once the clips slide outwards, the stick should pop up and out of the socket. Then just remove the stick from the socket. We recommend storing it in a static-proof bag or container after removal to prevent damage to it. First, remove your memory from the anti-static bag and hold it carefully by the edges. Try not to touch the gold contacts at the bottom of the module. Find the first open memory socket (closest to any existing installed memory) and make sure the white clips on the socket are open. If they are open, they will be resting at an angle to the socket, rather than straight up and down. Look for the notch or notches cut out of the bottom of the memory stick, in between the gold contacts. Then look at your memory sockets. You should see a corresponding ridge or ridges (also known as keys) in the memory socket that match up with the notches on your memory stick. Once you have the memory lined up with the socket, firmly press straight down on the top of the memory stick until it clicks into place in the socket. When the memory is properly installed, the clips will click into place in the sides of the stick, holding it in place. You should also barely be able to see the tops of the gold contacts. Almost there! Now you just need to make sure you reconnected any internal cables or cords you unplugged and then replace the door to your case. Replace any screws you removed. Plug in any cables or cords you removed, then power on your computer. You're done!